FREDERICTON, NB – Picaroons Traditional Ales and the Fredericton Region Museum have announced a new partnership based around an important event in New Brunswick’s history. As noted back when it was first available in February, Picaroons’ 104th Regiment Ale commemorates the 200th anniversary of the 104th Regiment of Foot leaving Fredericton for a 1100 kilometre march to Kingston, Ontario to reinforce the British garrison during the War of 1812. The beer has now been re-released in conjunction with an exhibition of paintings depicting the march by members of La Société culturelle Saint-Basile. An opening reception will take place at the Museum today (Wednesday June 12th) at 5:00 PM, with Picaroons on hand to serve samples of 104th Regiment Ale. In addition, 25 cents from every bottle of the beer sold at ANBL locations will be donated to the Museum. 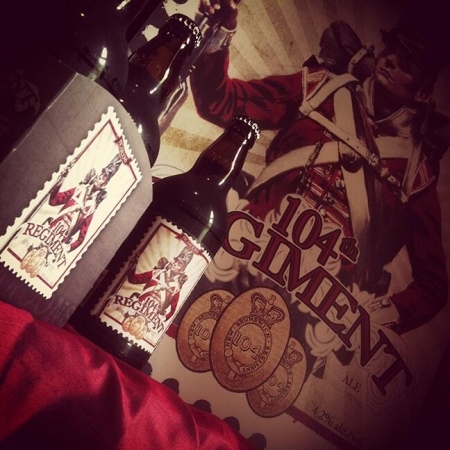 104th Regiment Ale is the first in a planned series of beers from Piacroons that will commemorate historic New Brunswick events and institutions. Details on the next beer in the series will be announced here on CBN when they become available.